This is not a mouse. Chevrotains, or mouse-deer, are tiny, even-toed ungulates. There are ten extant species in the family Tragulidae, all except one of which are found in the forests of South and Southeast Asia. 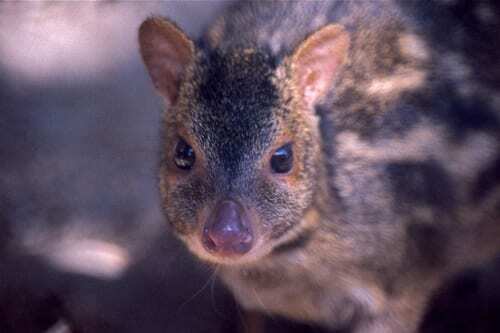 The only exception, the water chevrotain, is native to West Africa. 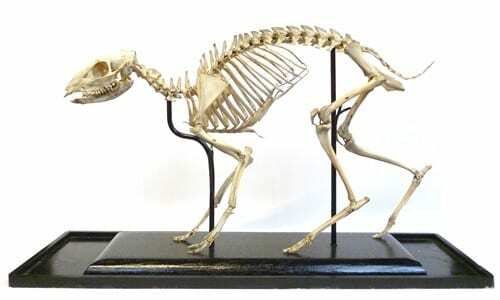 This skeleton is of an Indian spotted chevrotain (Moschiola indica). They typically reach lengths of 60 centimetres and weights of about three kilogrammes. Awww. This is not a goat. Goats are the nine species in the genus Capra, and part of the Bovidae (cow and antelope) family. 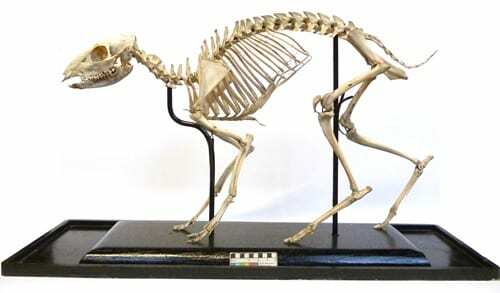 So, tell me more about this not a mouse-deer-pig-goat? 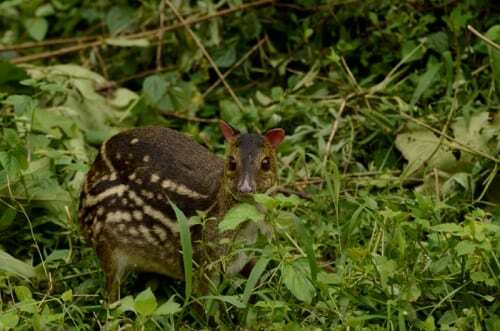 The Indian spotted chevrotain is reportedly found throughout the forests, fields and rural gardens of India. They are nocturnal, solitary and spend their days hiding in tree hollows, rocky crevices or even just lying in the long grass or leaf-litter where they rely on their camouflaged coat to keep them safe. At night they emerge to feed, foraging on a range of small shrubs, herbs and fallen fruit. They are neither strong nor swift, but rely on their ability to plunge into dense undergrowth and small spaces where potential predators cannot follow. This is not always enough, however, and mouse-deer are a reliable food source for a long list of predatory mammals, reptiles and birds. The females give birth to twins (usually) after a five month gestation period. The young are weaned after about 12 weeks and go on to breed themselves within the first year. Parental care is relatively limited, but then what could their mother actually do when faced with a 50 kilogramme leopard?